Extreme Felt Eyeliner by MUA (Makeup Academy) - Review & Swatch! | Sahrish Adeel - Malaysia based Pakistani Beauty & Lifestyle Blogger! 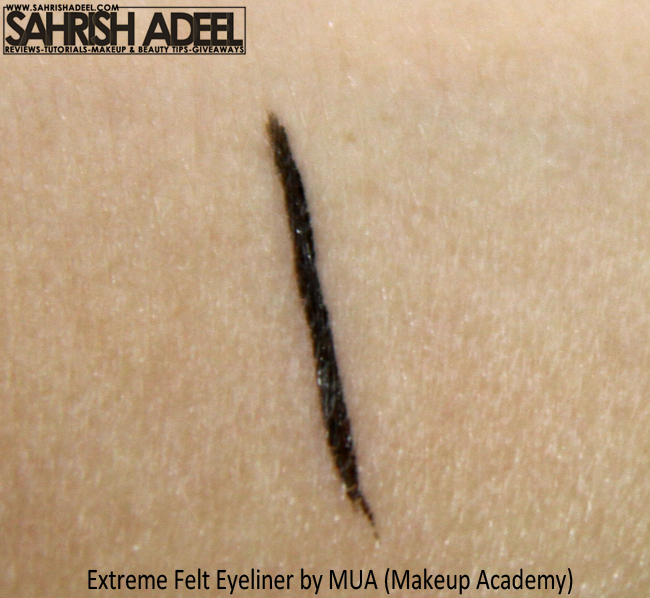 Extreme Felt Eyeliner by MUA (Makeup Academy) - Review & Swatch! You love eyeliners but it's hard to get a nicely defined line? 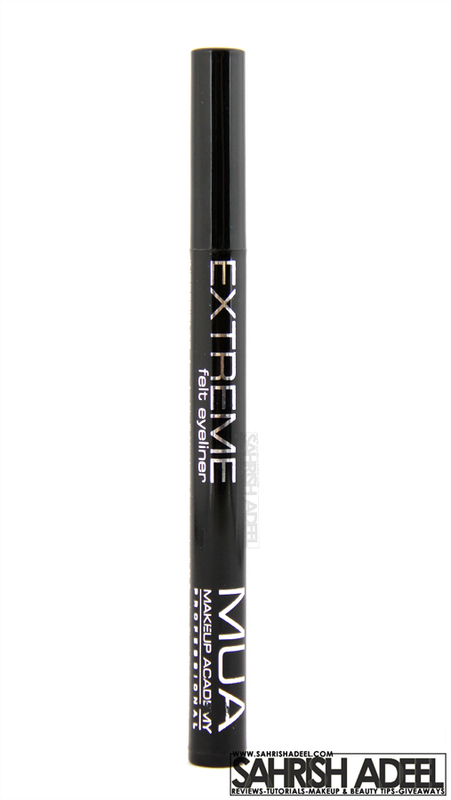 MUA's Extreme Felt Eyeliner will make your life easy for sure. 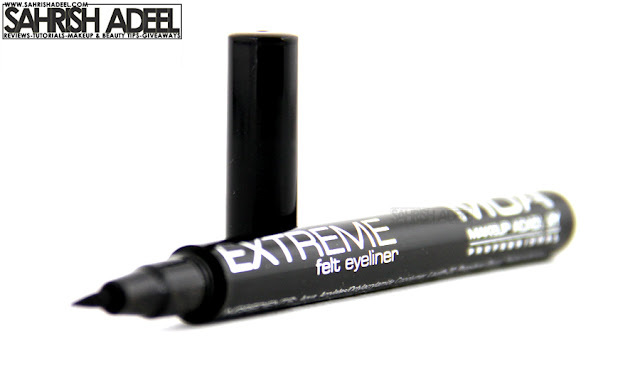 MUA says: 'Enhance your eyes with this amazing Extreme Felt Liner. This easy- to- use pen creates dramatic and powerful eyes- apply in one quick and easy swoop across upper and lower lash lines. For a feline effect, flick line up towards outer corners. Extreme Felt Eyeliner is in black color and has a plastic body. The cap closes up with a lock system so it will stay air tight. 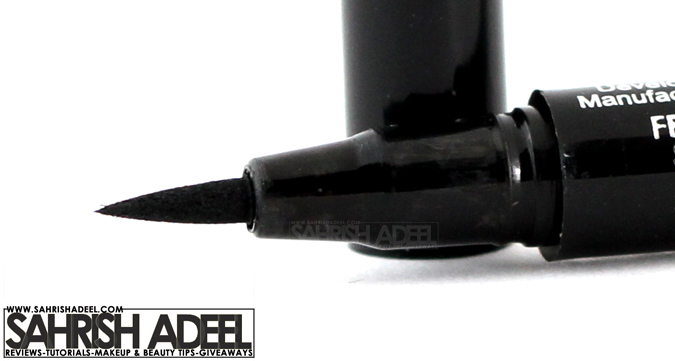 This eyeliner has a felt tip and it dries to a matte finish. This type of eyeliner is commonly known as pen liner. I ordered this eyeliner with a few other things from MUA's website. Everything came in a bubble wrap, nicely packed and in one piece. Felt tip gives precise results from extra thin to thick application. Stays for 4-6 hours and more. Extremely light on skin like you are not wearing anything. Perfect to carry in handbag. Tones down after 1-2 hours on oily lids if not applied over an eye shadow or an eye primer. Should come in more colors. I took this swatch on back of my hand and it stayed that way for like 8 hours. One of the best things I bought is this Extreme Felt Eyeliner by MUA. I have tried their products for the first time and I am really impressed with the quality. Just a tiny bit turn off from MUA was that I received my package in about 35 days or so and another one that I ordered on the same day, never reached. Though they were really nice to refund the money but I was heartbroken. Anyways, back to the review, I absolutely love to apply eyeliners but I am not at all good at precision. Most of the times when I am getting ready, I am the last one to get ready and so I am always in a hurry and usually I end up using the easiest products possible. The eyeliner has made everything so easy for me. Any person who can draw a line with a marker can use this perfectly. It dries up real quick so there is no chance of ghost eyes in my case when I am doing multiple things at a same time (for people who does not know, I have a 3 year old son). This liner is even easy to use on lower lash line. I have applied it alone but it tones down a bit after one or two hours as I have got oily lids but if I use a primer or simply an eye shadow, it stays put throughout the day. The best thing is that it is smudge free and water resistant. Also, usually with gel or liquid eye liners, I feel that I am wearing something on my eyes and especially liquid ones make me uncomfortable by giving that stretchy feel on lash line (getting me?). But this felt eyeliner is amazingly light just as I am not wearing any eye liner. It also gives fine results in creating winged eyeliner look. Overall, I am extremely happy with this eyeliner but I want MUA to make it in more colors. I highly recommend it to each and every one of you if you want eyeliner that is good in quality, precision and is light on pocket. Extreme Felt Eyeliner by Makeup Academy (MUA) costs £2 and can be bought online from MUA's website here. Check out their Facebook fan page here. MUA ships worldwide. If you are living in Pakistan, you can buy this product for PKR 350 from Just4girls.pk here. Have you tried any product by MUA yet? You can also check out my Haul post here where I have more products that I bought from MUA recently.